The contemporary style of the Signoria Firenze Platinum Sateen bedding features three lines of embroidery in a contrasting color. Color options included Pearl with Ivory, Khaki with White, and Silver Moon with Pearl. Perfect for those who cherish a lifestyle of simple elegance. Made in Italy from 100% Egyptian combed cotton. A new introduction from Signoria Firenze, makers of fine Italian linens, Signoria Onda is inspired by the soft and sinuous movement of waves and has a contemporary flare. 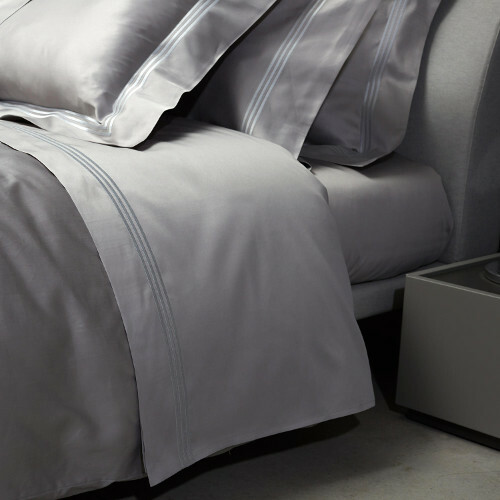 This printed 300 thread count cotton sateen collection is offered in a duvet and sham in natural or blue-grey tones. Coordinates beautifully with Signoria sheeting.